EDITOR’S NOTE: We blacked out the name of the cat’s owner. But if you are that person, the Daily Freier wants to help you get your cat laid and will be happy to add any relevent contact info to this post. Let us know. Yet today the site is in a bit of trouble with the Authorities. 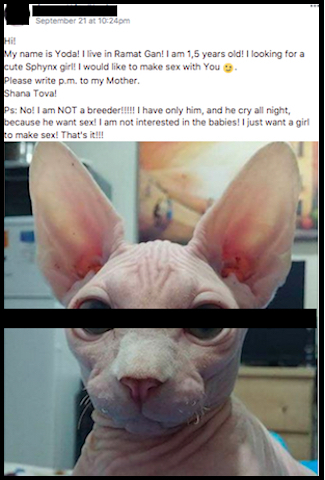 Just before Shabbat, a Ramat Gan woman wrote a post attempting to procure a female cat for her male Sphynx named “Yoda” to have sexual relations with. 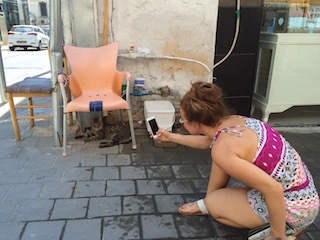 Now the Tel Aviv Police Department’s cyber-crimes unit is investigating this possible case of cat-pimping. The Daily Freier walked down to the police station on Dizengoff to get all the facts. Naturally, the post was so strange that Secret Tel Aviv’s readers chose to ignore it and….. JUST KIDDING! They lost their minds! There were 80 comments before the Admins shut it down! A third of them were women (Yes. They were ALL Women) urging the owner to get Yoda’s junk “snipped”. A third of them were people trying to facilitate a cat hookup. And a third of them just stopped by to stare.